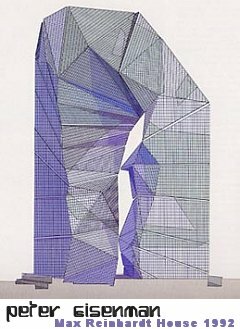 From the literary philosophy of "Deconstruction" comes the architectural and design school of "Deconstructivism". Inspired by Russian Constructivism, Deconstructivists believe in challenging the basic assumptions of Modernist design (for example, that rooms should be rectangular in shape, or at least that walls should be straight). There is also the influence of Italian Futurist architects such as Antonio Sant'Elia, particularly the striving for dynamic forms. Explodes architectural form into loose collections of related fragments. Destroys the dominance of the right angle and the cube by using the diagonal line and the `slice' of space. Searches for more DYNAMIC spatial possibilities and experiences not explored (or forbidden) by the Modern Movement. Provokes shock, uncertainty, unease, disquiet, disruption, distortion by challenging familiar ideas about space, order and regularity in the environment. Rejects the idea of the `perfect form' for a particular activity and rejects the familiar relationship between certain forms and certain activities. 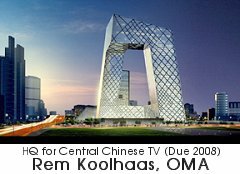 Note the work of the architects, Peter Eisenman, Bernard Tschumi and Zaha Hadid. Eisenman was at one stage in his career very influenced by Postmodernist theory, as evidenced by his collaboration with philosopher Derrida and architect Bernard Tschumi on a garden for La Villette. As demonstrated in the recent interview for FloorNature linked below, he has now become disillusioned by Postmodern theories such as Semiotics and is aiming for a more 'sensual' style to his designs. Eisenman paid homage to Gerrit Rietveld by designing his own version of the Zigzag chair, and by using De Stijl colours on many of his works during one period. 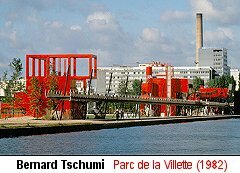 Bernard Tschumi (1944-still living): Swiss-born architect of the "Parc de la Villette". 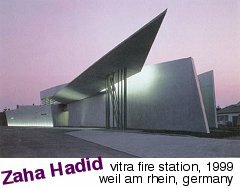 Zaha Hadid (1950-still living) Iraqi-born British architect, first female winner of the Pritzker Architecture Prize (2004). Her work is very much influenced by Supremetism, an offshoot of Russian Constructivism whose emphasis was on the spiritual and cosmic possibilities of design. Painting and drawing is an important part of the exploration of her designs. Quotable quote: "Would they call me a diva if I were a guy?" Just as the Deconstructivist Architects designed buildings that broke the rules, so too did Industrial Designers. Ron Arad - creator of the Rover Chair. Have you ever noticed that some car seats are far more comfortable that your chairs at home? Well, why not rip some seats out of an old car, stick them on legs and create an exclusive Designer Original? 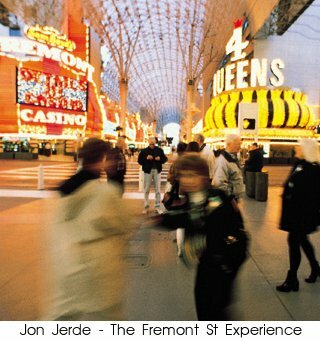 Jerde makes People Pleasing buildings, such as the world's largest shopping centre the Mall of America (Minneapolis) and the flashy Fremont St Experience (Las Vegas). Populism is giving the people what they want (or, it could be argued, what they think they want because they just haven't seen anything better yet...). Usually, populism is fairly conservative, in favour of the status quo. As linked above, there is a grass-roots movement in NY against building a new design built on the WTC site. 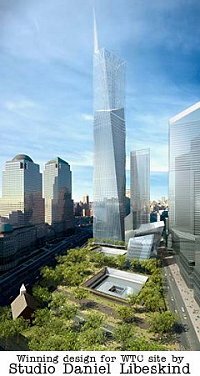 Petitions are being written and rallies organised with the goal to have the WTC rebuilt exactly as it was before 9/11. As a designer, there is always the dilemma between giving people what they want and telling them what they want. After all, you don't want to keep rehashing the same-old same-old as it would make for a pretty boring job as a designer. Or in fact, no job at all. How does the issue of gender affect design? Do 'women designers' design in an intrinsically different way to male designers? "There are a lot of situations where women are working for male creative directors — putting their creative talents to work for some guy who’s going to put his name on their designs and sell them for big money. Consider, for example, industrial design star Karim Rashid, who has a staff of designers working for him.